I first heard about the Secret Stash label in my local paper the StarTribune. I was intrigued, but I let it pass. On Record Store Day 2012 at the Electric Fetus the guys from Secret Stash were spinning some of their stuff and it sounded great. I went home and looked at the Secret Stash website and this release caught my interest. Unfortunately the vinyl release was no longer available, so I headed over to emusic and downloaded it from there. If I had only 5 recordings to take to a deserted island, Miles Davis’ Kind of Blue would be one of the five. I have been listening to the album for 30 plus years and it never ceases to amaze me. 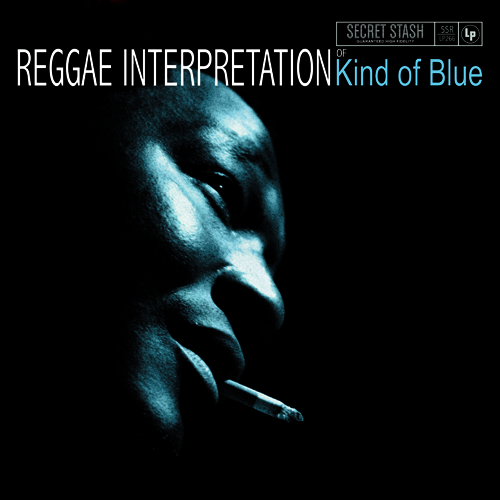 If someone asks to be introduced to jazz, I always suggest Kind of Blue. Most of its songs have become jazz standards. The original recording always had a wonderfully funky syncopation and so it is not a surprise that the reggae rhythm works and does not come off as a gimmick. I am not sure why, but this release reminds me of Pink Floyd’s Dark Side of the Moon. I guess the reggae interpretation brings out that smokey and spacy ambiance. The back story is that a music professor from NYU, who was infatuated with Jamaican musicians, put this session together in 1981. The professor, Jeremy Taylor, passed away shortly after this recording and it remained unreleased until the guys at Secret Stash released it in 2009. I have not had a chance to explore the rest of the Secret Stash catalog, but if this is representative, then I have some fun ahead of me. This is an outstanding release and highly recommended. Whether a jazz head, a reggae aficionado, or hip hop beat lover this album will stir your soul. An absolute gem.